Recently, while I was hired to cook for a new client in Idaho for nearly three weeks. While there, I was introduced to a new ingredient called Tigernuts. In case you're unfamiliar with the ingredient - as I was only weeks ago - tigernuts are NOT a nut. They are actually small root vegetables called tubers. They're a paleo person's dream ingredient. Gluten-free, nut-free, dairy-free, amazing! I'm sure you'll see it on the shelves in your health food market soon but in the meantime online is the only way to find it. 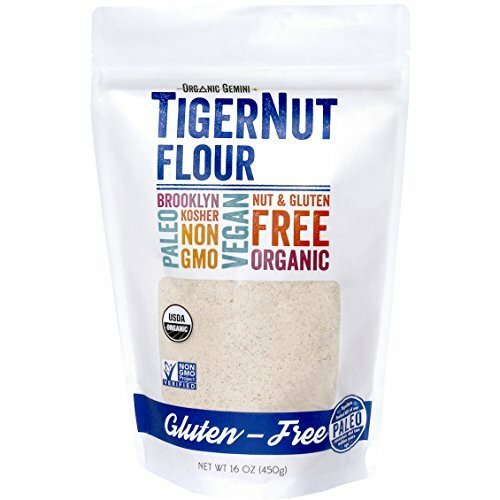 While using this new ingredient, I explored new and interesting was to use it and ended up making things like tigernut milk, tigernut carrot cake, tigernut fig newtons, and of course, tigernut chocolate chip cookies. Which, for the latter, you are in for a real treat. Today, I'm happy to share with you my fabulous recipe for some very yummy Tigernut Chocolate Chip Cookies. Although, it sounds tempting to do, just be sure not to eat them in one sitting. In a medium bowl combine the ground flaxseeds and milk and let sit for 5 minutes, to allow the flaxseeds to absorb the liquid and become gelatinous. Then add the remainder of the ingredients, minus the chocolate chips and cacao nibs. Mix until the dough is uniform. Add in chocolate chips and cacao nibs until evenly mixed thru. With a small ice cream scoop, place cookie dough on a parchment lined cookie sheet at least 3 inches apart – should yield about 10 cookies. Lightly sprinkle with your favorite salt, like maldon. Bake for 14-16 minutes, until the edges are slightly brown and hold their shape when you touch the sides. Note: Allow to cool before having a bite!